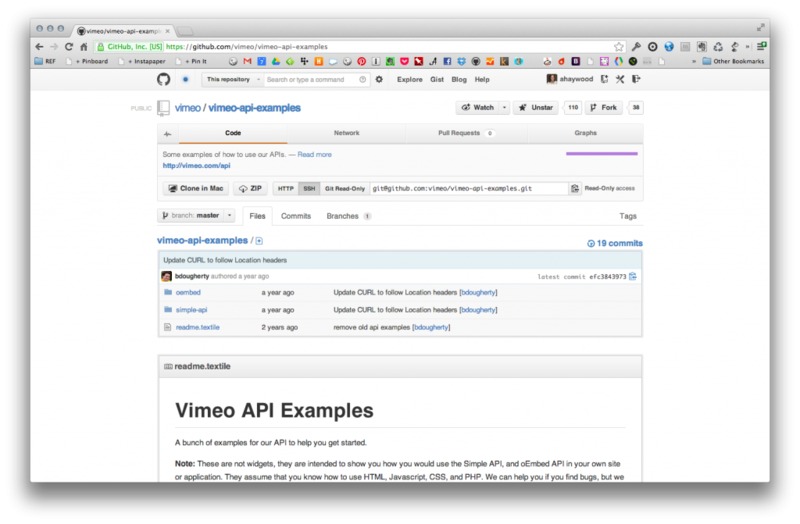 A while back, I wrote a post on displaying a Vimeo feed using jQuery. However, I quickly discovered, my code was outdated. None of it worked! Even the site that I referenced in my post, their code didn’t work! My Google Search returned my post as the top hit! — and any links after that were outdated too! So, I wanted to update my content, using code that actually works (go figure). I found a code repository on GitHub that had everything I needed. So, download the code (direct link). You’ll see there are several examples for you to work from. No need to reinvent the wheel! For the site I was working on, I neeed to display a featured video at the top with thumbnails beneath it. Within the simple-api folder, there’s a folder called gallery, then I grabbed the js-example.html file. It already has everything you need. I copied the CSS out of the header, and placed it in my site’s CSS. See the Pen 0f95ad9ca28dad9a3367d7a81dc6d55a by Amy Dutton (@ahaywood) on CodePen. Replace the vimeoUsername name with the vimeo user you’re trying to pull from. Then, copy and paste the containers within the HTML, into yours. it’s important that you leave the id tags alone so that the JS can grab them…errr.. if you’re going to change them, change them within the JS file too. Also, make sure those tags don’t conflict with your existing DOM. You should be good to go! — Unless of course, you want to restyle some elements (which is what I did). But, this will at least get you pointed in the right direction. 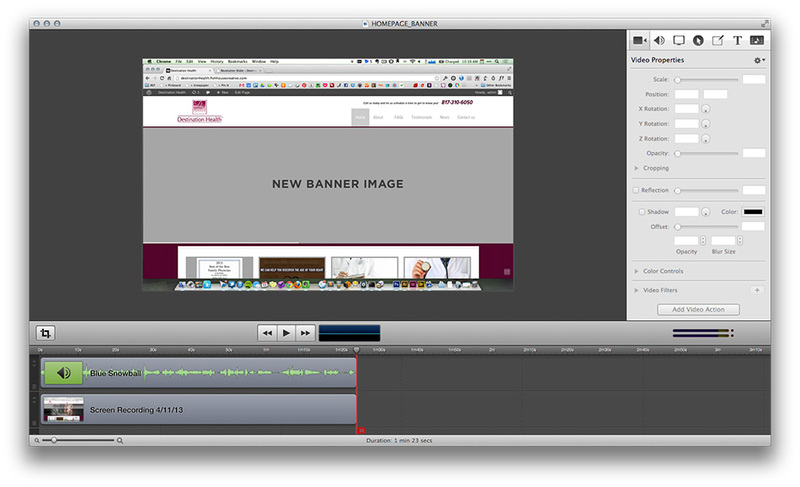 One of the things that I’ve started doing recently for all my clients, when they get a WordPress site, is creating video screencasts for training. It’s so much easier than writing out documentation, submitting it as a PDF, and hoping they’ll be able to find it when they get ready to update their site. This is probably the most expensive piece of the puzzle ($99). There are several different screencasting apps for you to choose from. I bought a license for Screenflow 2 years ago, so it was just one easy payment of $29.95 for the upgrade. But, if you pay attention to a lot of the movers and shakers online, this is their weapon of choice. This software offers quite a bit of features. When you’re ready to go, just select “Record” from the menu and you’re off to the races. When you’re done, it launches an editing panel, where you edit your video. It makes it nice that it’s an all in one piece of software and I’m not having to switch to Premiere or Final Cut. Usually, I’ll just trim off the beginning and the end and export. This is a little program that I found on the App Store ($4.99). I got purchased it when I was speaking at Women’s Forum last fall. For $5 the ladies there were just impressed with this program as they were with my talk…not sure what that’s saying…about me or about this program! But, it allows me to spotlight my cursor, show red circles when I click on something, and then if I type, it shows an overlay of what keys I’m hitting. — Which is great, because I’m a huge fan of short cut keys. Most of the time, I don’t even think twice about it. So, at the very least, with this it helps the user follow what I’m doing. I hate it when I go to websites, watch screencasts, and the speaker sounds like he’s coming through a tunnel. 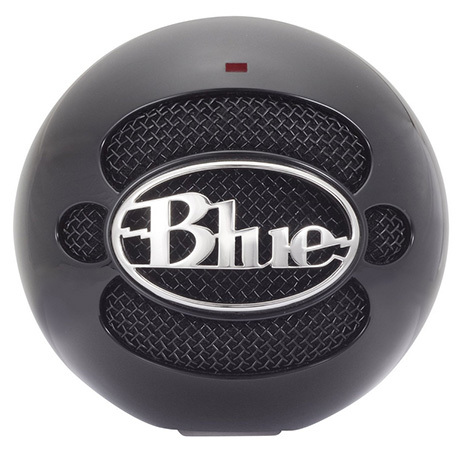 This might be a frivolous purchase to some, but IMHO for $68.99 dramatically increases the quality of production. It was insanely easy to setup. I extended the legs on the stand and screwed on the snowball. Then, there’s a USB port on the back that plugs directly into my laptop. 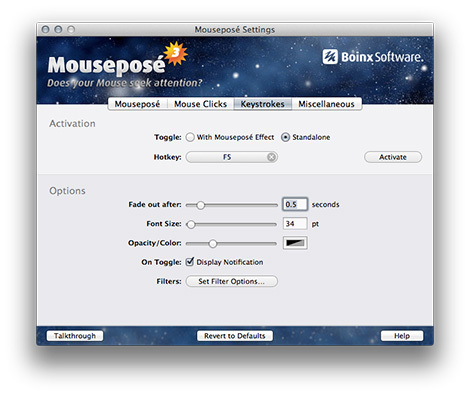 When I open up Screenflow, it automatically recognizes the microphone. I just make sure it’s selected in the dropdown. Done. I didn’t want to have to worry about compressing my videos, customizing a player, or storage. This was by far the easiest solution. It’s only $9.95, or I went ahead and paid $59.95 for the entire year. Vimeo’s pretty slick. I knew I always preferred their video player to YouTube’s, but they’ve done an execellent job in refining their product. For example, I can connect my Dropbox account to Vimeo. When I export a video, I can simply drop it in Dropbox. Then, when I log into Vimeo, I can simply port it over. Of course, the upload button works too. 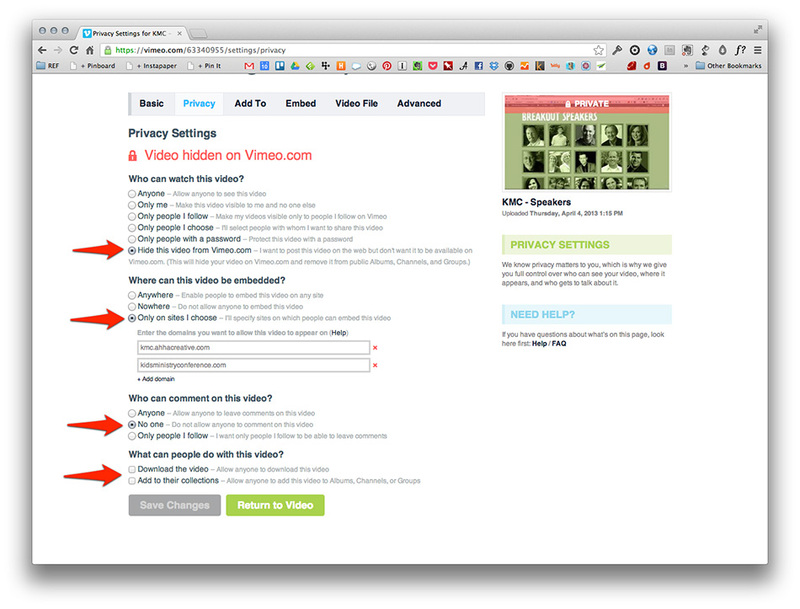 Who can watch this video to “Hide this video from Vimeo.com” only my clients need to be able to see this information. Besides, I don’t want to make it any easier for Joe Hacker. Where can this video be embedded? to “Only on sites I choose.” Then, I’ll list my client’s URL and if the site is currently on a staging site, I’ll my staging server too. Who can comment on this video? No one. Honestly, I’m not sure if this setting necessarily makes a difference because we already determined that we’re hiding it from Vimeo. At this point, I can grab the embed code. 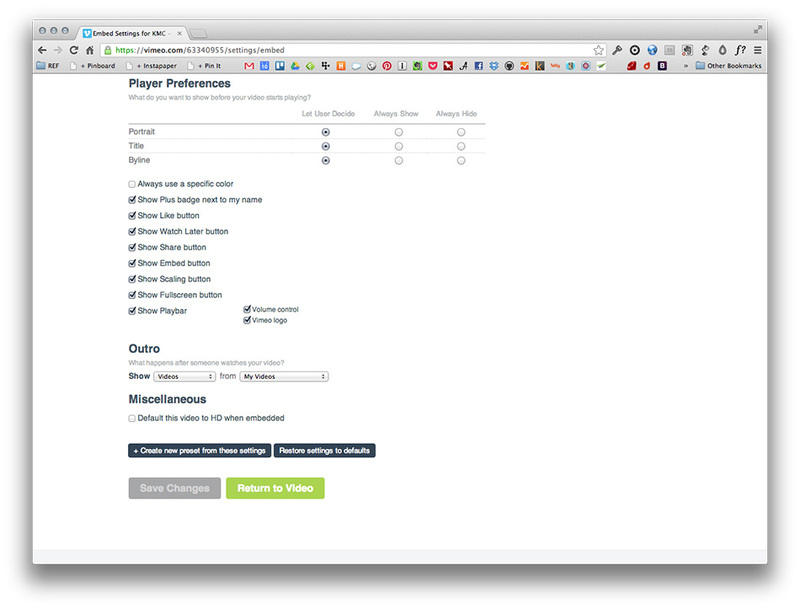 But, if you’re interested, there’s several other settings you can mess with, especially under the “Embed” tab. Like changing the color. This is the last piece of the puzzle and argueably the most important. I install this plugin on my cleint’s site. It then provides a link in the left hand navigation that they can visit when they’re logged in. 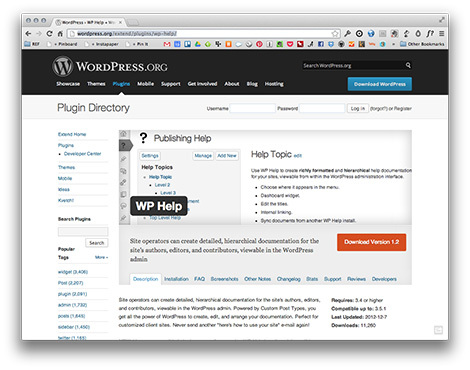 Then, I just add posts, similar to writing a standard WordPress blog post and copy and paste the embed code provided by Vimeo. That’s it. It’s pretty simple, but in a small way, I’m quickly adding a big value to the sites that I build for my clients. What other ways have you found that increase the value of your work? Do you make screencasts too? What’s been your experience? Do you use the same software?